Unique prenatal and postnatal formula for pregnancy and breastfeeding. Beneficial for the developing child and newborn, as well as for the mother. 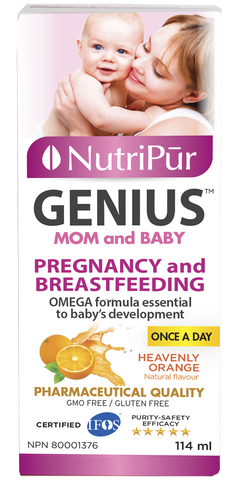 Provides essential nutrients for the development of the brain, nervous system and eyes of the baby during pregnancy and of the newborn during breastfeeding. Will prevent pregnancy induced depletion of DHA stored in the mother which is associated with post-natal depression.> Highly concentrated in Omega-3 DHA, EPA, AA & GLA. Highly concentrated, great tasting with fast acting visible results. Does not contain artificial colours, flavours, sweeteners or preservatives. Certified PURE 100% natural. CERTIFIED IFOS / 5 STAR RATING: IFOS sets the world’s highest standards for fish oil safety, purity, quality, potency and freshness. Non-medicinal: Antioxidant blend (mixed tocopherols, ascorbyl palmitate, citric acid),natural orange flavour, certified ORGANIC stevia rebaudiana leaf. Docosahexaenoic acid (DHA): an omega-3 fatty acid, is mainly concentrated in the brain and retina cells. It has been recognized as essential for infant brain development and retinal function. Studies of preterm infants have shown the importance of dietary DHA in learning.DHA has further been shown to play an important role in treating ADD/ADHD. Eicosapentaenoic acid (EPA): also belongs to the omega-3 family and is essential for the production of anti-inflammatory compounds. DHA and EPA are found primarily in cold water fish such as mackerel, sardines, anchovies and tuna. Borage oil : Omega-6 fatty acids, particularly dihomo-gamma linolenic acid (DGLA) and gamma linolenic acid (GLA), the precursor to DGLA, also play an important role in healthy brain function. Researches have shown a DGLA deficiency in children with hyperactivity. Valuable quantities of GLA are found in borage and evening primrose oil, with borage being the richest source, containing 20% GLA. Certified Organic Flax seed oil : Another omega-3 fatty acid, alpha-linolenic acid (ALA), is found in high quantities in flax seed and flax seed oil. ALA is the parent omega-3 and precursor to EPA and DHA. Experimental studies have shown that ALA supports learning and memory. ALA is metabolized into DHA, providing additional benefits to the brain. Soy lecithin: Rich in Phosphatidyl choline (PC) which can be found in soy lecithin, is a component of all cells in the body. It also acts as a source of choline which is the starting material for the synthesis of acetylcholine, a neurotransmitter involved in learning and memory. Studies have shown that supplementation with PC helps in learning and memory. Vitamin E : a valuable additive to any EFA oil, as it helps prevent oxidation of the oil. For the developing child and a healthy mother. Fights postpartum depression in mothers. For the developing child and newborn via delivery through breast milk. For the brain and nervous system of the developing baby. Aids in the development of the nervous system. Pregnant and breastfeeding women: Take 1/2 to 1 teaspoon daily. Nutripur is a 100% Canadian owned and operated company. It specializes in the manufacturing of traditional herbal medicines and nutritional supplements. Founded in 1989, Nutripur focuses its efforts on the development of various products which address specific health problems. Certified PURE. Contains no artificial colours, flavours, sweeteners or preservatives. All Nutripur products are manufactured in a manner that exceeds industry standards and are rigorously tested in accredited laboratories for toxic contaminants and heavy metals assuring the safety, purity, efficacy and high-quality of our products. Proud to be Canadian.